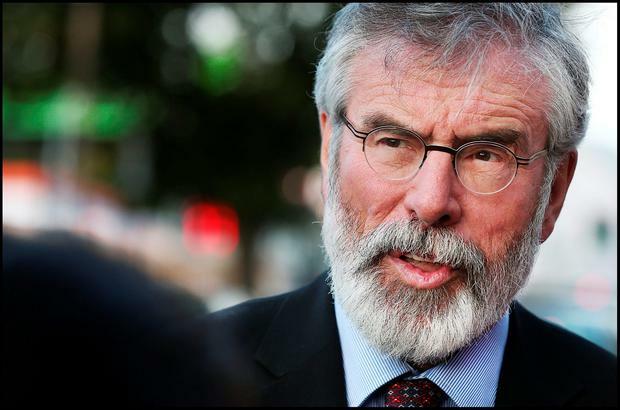 Sinn Féin leader Gerry Adams has sparked outrage after he claimed there is no such thing as "gangland" and appeared to suggest that his party would consider placing jurors in witness protection schemes in the event of the abolition of the Special Criminal Court. Mr Adams yesterday produced one of the most significant gaffes of the General Election campaign after he was unable to answer direct questions about Sinn Féin's plans to scrap the juryless court. During a shambolic press conference, the Louth TD flip-flopped on earlier suggestions that Sinn Féin would place jurors in witness protection-type schemes in the event of the court being scrapped. Just 48 hours after the horrific gangland attack in Dublin, Mr Adams said there was no such thing as "gangland". And he claimed that the murder of David Byrne, as well as others, would not have happened if the Special Criminal Court worked effectively. "First of all, if I can just say this, as a little matter which always irks me, there aren't any ganglands. There is lazy journalism which uses the word gangland as if these communities were lands that gangs inhabited," Mr Adams said. "There are gangs and they are clearly ruthless, they're mercenary, they're greedy, they're very, very, very dangerous indeed." Asked how Sinn Féin would protect witnesses and jurors if there was no such court, the Louth TD said schemes are in place in other jurisdictions to ensure safety. "In Britain, across the European Union and the USA, they have witness protection programmes and they deal with criminality and they bring those that are accused and they are subject to due process," Mr Adams told reporters. "There are measures which can be used to deal with all of that," he added. But when asked whether he was effectively proposing to place jurors into "hiding", Mr Adams replied: "Listen to your tape and if you hear me saying that I'll give you a ticket to the Bruce Springsteen concert." Mr Adams is a vocal critic of the Special Criminal Court, which is due on Friday to sentence his friend, Thomas 'Slab' Murphy, for tax fraud. He has stated that the UN has raised human rights concerns in relation to its existence. But during the fourth day of the campaign, the Sinn Féin president was forced to admit that he did not know what his party intended to do in the event of the abolition of the court. "You would have to go and check on those and we will, if you wish, come back in detail on that. But our broad principle is that everyone has the right to a jury of their peers," he said. "I spent four and a half years imprisoned without any trial at all. Do you think that's fair?" When it was pointed out to Mr Adams he could not furnish any details about abolishing the court, he replied: "Sorry, you can't understand plain English." Last night, Justice Minister Frances Fitzgerald said Friday's murder illustrated the strong necessity to maintain the Special Criminal Court. "The Special Criminal Court is there to deal with gangs and dissidents or to interfere with anyone who in turn wants to interfere with the criminal justice system," she said. "To seek the abolition of the court is to deny the dangers that criminal gangs and dissidents have posed, and will undoubtedly continue to pose, to witnesses," she added. Taoiseach Enda Kenny branded Sinn Féin's ongoing campaign to have the court abolished as "outrageous" in light of Friday's gangland attack. "I think it's outrageous. What's at stake here is the security of our State," he said. "The people who carried out this absolutely appalling crime in the Regency Hotel - in a well-planned, professional hit - have no regard for the laws in our democracy."